So I spent my Saturday evening visiting three various thrift shops stretching from Rancho Cucamonga, Ontario, and Upland to make some purchases and pop some tags. Thrift shopping is not really a new thing for me or for anyone for that matter. I did not grow up particularly rich, so I was use to going to thrift shops, old churches, or rummaging through hand-me-downs to find some outfits. And even though I can somewhat afford some new retail clothes, and don’t get me wrong I do buy new clothes, there is something really dope about rummaging through a bunch of stuff and finding a cool flannel or a Suicidal Tendencies T shirt for 2 dollars that no one else has. For me it makes my style and my outfits feel a bit more personal. When I began working my first job at Hollister, which is anti-thrift for a number of reasons (it’s overpriced, the CEO has been quoted for wanting fat free clientele, it’s racy sexualized images of teenagers, it’s racist hiring and marketing practices, it’s comments on how it would rather burn clothes then have poor people wear them, I could go on) I realized how ridiculous it was to buy something overpriced because it was a brand. Cars, clothes, and industries have that sort market and make money off of using the class issue of branding. Buyers of overpriced items consist of rich people who want to show off their stature, people who deeply enjoy the aesthetic of the brand and the outfits, people with a sense of ‘brand loyalty’, and poor people trying to pose like they can afford the outfits and pretend to have the stature. Macklemore’s “Thrift Shop”- a song about, individuality through fashion, the idiocy of spending insane money to purchase a mass produced unoriginal outfit- became a hit, hipster culture of vintage clothes and Tumblr was already pretty huge, and the trend of going to thrift shop to buy stuff began. While the average person does not go thrift shopping for clothes, the influence of the ‘thrift culture’ is strong. Big clothing companies began selling vintage-style clothes and affordable stylish clothing companies like PacSun, H&M, and Cotton On replaced clothing giants Hollister and A&F in terms of popularity. 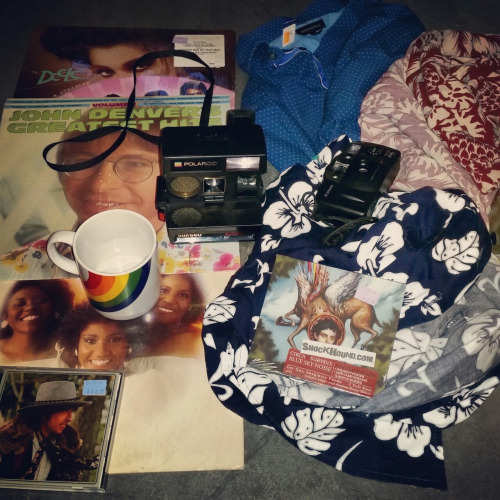 Shopping thrifty is about more than buying old clothes from a kind like dead grandma and a bargain. A lot of stores, popular ones or obscure places, have lots of great deals. Old Navy is a place I recommend, even Hollister had a lot of great cheap deals at it’s outlet store. But here is the stuff I bought and the kind of stuff you can also find at your local thrift store if you look hard enough. 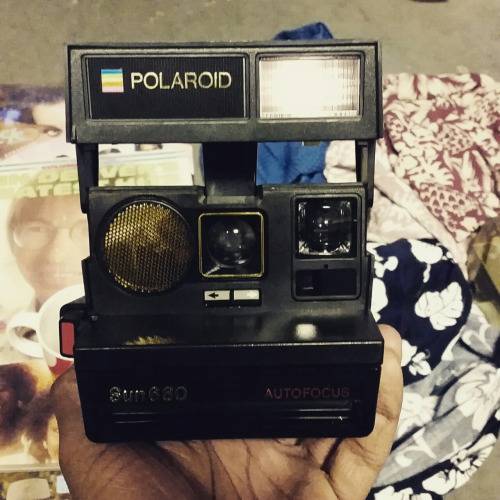 I copped this polaroid camera for only twenty dollars, which is cheaper than the average cost of polaroid film. I don’t know whether that’s a good thing or not. My last photography series was comprised of 35mm camera film, which is an aesthetic I really enjoy. So instead of purchasing a bunch of disposable cameras, I bought a film camera from the thrift store for $1 along with the polaroid. And clothing wise I got three shirts and a flannel to begin the summer. My point, don’t be afraid to do some shopping at a thrift store. It’s less wasteful, it’s cheaper, and you can find some unique finds. I’ll have some more film photography up soon.